The Sunflower by Day will Close Aug 28th. Unfortunately, due to lack of traffic and poor visibility of our current location on Fountain and Weber, we will be closing our doors with the close of the business day, on August 28th. We have enjoyed serving our community, and are looking for a new location that would accommodate our concept. As to date, we have not found a building of the right size, and with kitchen capability. If and when we do, we will post on Face book for The Sunflower and The Moonflower where we are, as this website, will no longer be functioning. Thanks for your patronage. Hope to see you in the future. This is all the information you need to know about The Sunflower, a neighborhood cafe, located in the Historic Lowell District, south of Downtown. 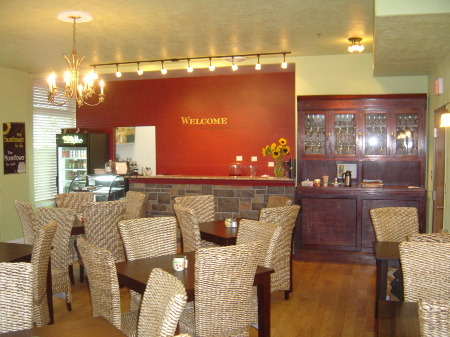 The Sunflower is a neighborhood cafe, dedicated to providing organic Fair Trade teas and coffees, as well as wholesome natural and organic soups, sandwiches, quiche, and salads. There are also special offerings for something a little heartier. 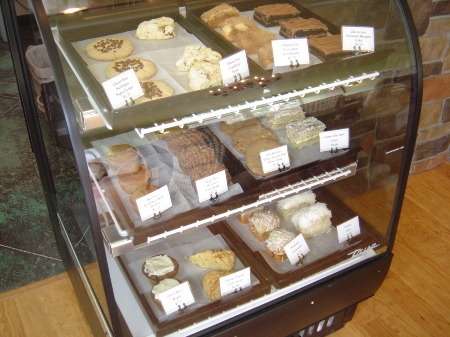 We cater to the Celiac community, with our entire menu being offered gluten-free. In addition, half of our pastries are gluten-free, while the other half are traditionally made and are whole grain, or amended grains. 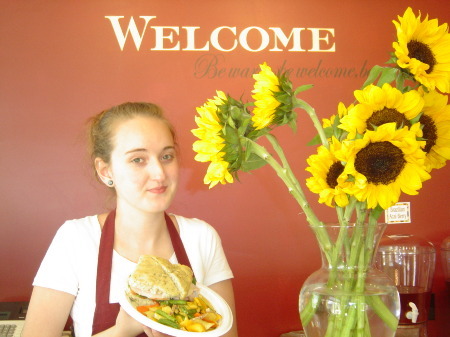 Vegetarians will find our soups are vegan, and we have two great sandwiches, a veggie muenster, as well as a vegan BLT. For those with allergies, we maintain a product log, to resource against your particular allergies. We have something for everyone! We have a contemporary setting, featuring banana leaf chairs, and rubber wood tables: all renewable resources. We serve on white porcelain dishes, but maintain compostable "to go" ware made of corn starch and plant materials. When it leaves here, we know it is not going to impact our world in a negative way. We always have a special for Seniors. Those 55 and older can select from our soup, salad and sandwich menu and do "halvsies"! A half a sandwich, a cup of soup, or a half a sandwich make for a lighter mid-day fare. Choose any two for a special senior only price. NOW OFFERING our complete Moonflower Wine List during the day for that special lunch. We have great Old World and Domestic wines as well as Bristol Brewing CO. beers. Need a place for a business lunch? We can take care of you. If you are not familiar with our company and your first contact with us is online: We would be pleased to hear from you! Please let us know what your needs and questions are, we will be more than happy to help. You can email us at: thesunflower@qwestoffice.net, or call us at 719-520-0649.